Mike Lilly is a New York City based comic book artist who freelances for major comic-book publishers on such titles as Black Terror, Annihilation Conquest Quasar, Vampirella, Nightwing, Batman, Detective Comics, Marvel Knights, Punisher, Catwoman, Green Lantern, X-Men Unlimited, and Dungeons & Dragons. Best Black and White Illustration Art Show Award of Excellence from I-CON 25. He has also collaborated with the interior design company Kreiss Enterprises. Lilly designed life size panels to depict an entire comic book story installed onto the walls of designer Loren Kreiss's New York City apartment. This pop-art piece was featured in The New York Times Real Estate section, The Financial Times Style section, Ocean Drive Magazine, Wizard Magazine and The New York Post. Mike is most known in the Star Wars community for his illustrated and highly sought after Star Wars Heritage original art sketch cards from Topps, Inc. His cards are the rarest in that line. Lilly's original art sketch cards can also be seen for the Revenge of the Sith trading card line, The Lord of the Rings Evolution and Masterpieces series, Frankenstein from Universal, The Vintage Poster Collection sketch cards from Breygent, The Complete Avengers from Marvel Comics/Rittenhouse Archives and DC Legacy archive editions from DC Comics. - On the website GraphicsKings.com, Mike's Meet the Bad Guy's-Fighting Yank work was included in their gallery 'Graphics Inspirations #31' amongst other artists. - Mike is slated to do 75 original art sketch cards for the Tarzan 100th Anniversary Trading Card Set from Cryptozoic Entertainment. Released sometime in 2012. - Also this past weekend (Nov. 17th to 20th) Mike's Team Diablo illustrations and graphics were showcased on Dune Buggy racers competing in the Baja 1000 down in Ensenada, Mexico. First time Mike's work was applied as car wrap graphics for a vehicle. Recently Mike has an 'art demo' in the book, Comic & Fantasy Artist's Photo Reference: Colossal Collection of Action Poses by Buddy Scalera. Mike contributed a 4 page art demo (with Mike's personal notes) using a posed model shot to create a sci-fi pin up from start to finish. You'll see Mike's sketches and roughs of the piece through to final tight pencils. It's located on pages 56 - 59 of said book (this demo was originally in the publication Comic Artist's Photo Reference: Men & Boys). Mike will be doing 15 cards for an Archive set from Rittenhouse based on the original Sgt. Fury and the Howling Commandos from Marvel Comics. 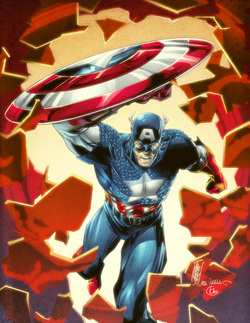 Plus he's doing a 200 card Avengers set as well from Rittenhouse/Marvel!!! ***Update on Mike's Marvel Universe Sketch Card count. Originally he was doing 100 cards but now (due to schedule) he'll be doing anywhere from 25 to 50 cards. Mike just compleated a cover for ComicCONN's (a one day comic book convention in Connecticut) convention program. With inks by DC Comic regular Jack Purcel and Marvel colorist Tom Chu. (image above in Mike's bio). Mike has recently completed a RARE 41 original art sketch cards for the upcoming Vampirella Trading Card Series from Dynamite Ent. and Breygent! These will be randomly inserted into pack throughout the series. Check out the cards under Trading Card Art (above)! Also Mike is working on a new Marvel Universe trading card series. He'll be doing roughly 100 original art cards for this set. Also NEW, under 'Commissions' above, you'll see new commission art by Mike from recent comic book conventions. Check 'em out!!! Mike has worked on designs, layouts and pencilling for the Guardian Project (a new line of comics based off of the National Hockey League teams) with Stan (the Man) Lee and Tony Chargin. Mike worked on the Dallas Star, New Jersey Devils and New York Islander themed characters. These were first showcased and introduced during halftime of the NHL's All-Star Game 2011(this past January 30th). Mike is also hard at work on a small set of original art sketch cards for Marvel Comics and Rittenhouse Archives depicting various female heros and villains from the Marvel Universe. A NEW Scholastic mini-graphic novel is scheduled to hit the school system from Mike's Studio. It's an adaptation of Shakespeare's Antony & Cleopatra with Mike doing all the character designs, layouts, pencils, inks and art direction. He was ably assisted with the bulk of the inks from sketch card godfather, Warren Martineck and indy superstar colorist and letterer, Wilson Ramos Jr.
MikeLilly is a freelance Comic Artist interested in Freelance Jobs.